We are proud to announce Airlift's new Loadlifter 5000 ultimate series. Loadlifter 5000 ultimate series provides the safest, most durable, and maintenance-free suspension option available for towing or loaded vehicles. Utilizing an exclusive internal jounce bumper, Ultimate is the only air spring available that provides a combination of suspension adjustability and safety feature similar to run flat technology. Internal jounce bumper helps the vehicle absorb shock and prevents vehicle from ever bottoming out. Eliminates harsh jarring even on rough roads. Maintenance free air springs! The jounce bumper allows drivers to safely run with zero tire pressure. Replaces the factory jounce bumper that is sometimes removed when adding air springs. Up to 5.000 pounds of load leveling capacity. 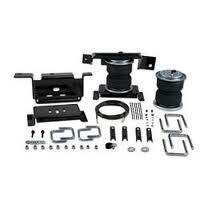 Buy any Airlift loadlifter 5000 , Loadlifter 5000 ultimate, Or ride control air spring kit and get $50 back. Buy any on-board air compressor system, Get $50 back. TOW AND HAUL WITH SAFETY AND COMFORT!! !